John Hay (1838–1905) was a unique figure in the history of the United States. No other statesman was so close—both personally and politically—to both Abraham Lincoln and Theodore Roosevelt. 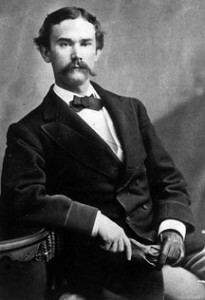 As a young man, Hay was one of Lincoln’s White House secretaries. He was not only a trusted aide, but their personal relationship was like that of father and son. Late in his life, Hay was secretary of state under Roosevelt. Again, their relationship was more than professional. The two men had a lifelong friendship, which began when Roosevelt was 12. Roosevelt’s father (also named Theodore) had worked closely with Hay on Army-related matters during the Civil War. In addition to his relationship with two Presidential icons, Hay had a remarkable career of his own. He was not only a statesman and diplomat, but also a highly successful poet, journalist and historian. Perhaps no other figure in the nation’s history was such a luminary in both politics and literature. Jerry Carrier is a longtime journalist who, after his retirement from the Philadelphia Daily News in 2001, launched a second career as an actor. He has a variety of credits in both theatrical and on-camera performances. In addition, he is an avid student of Civil War history. 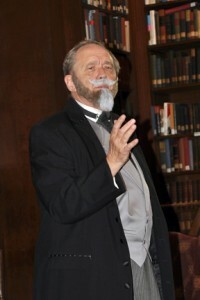 He is vice president of the Delaware Valley Civil War Round Table and teaches several courses about the war at Manor College near Philadelphia. In preparing this one-man show, Jerry found much in common with John Hay. Both men were born in Indiana, and both were employed by major newspapers. In fact, Jerry grew up just 35 miles from Hay’s birthplace. John Hay left a legacy of letters, diaries, articles and books, rich with witty and colorful observations about his own life and about Lincoln, Roosevelt and other figures. This wealth of material has made it possible to present Hay’s life story as Hay himself would have told it. Wherever possible, the words in this presentation are Hay’s own. The presentation runs approximately 40-45 minutes, leaving ample time afterward for questions from the audience. This entry was posted in Meeting archive on July 8, 2010 by hlj.